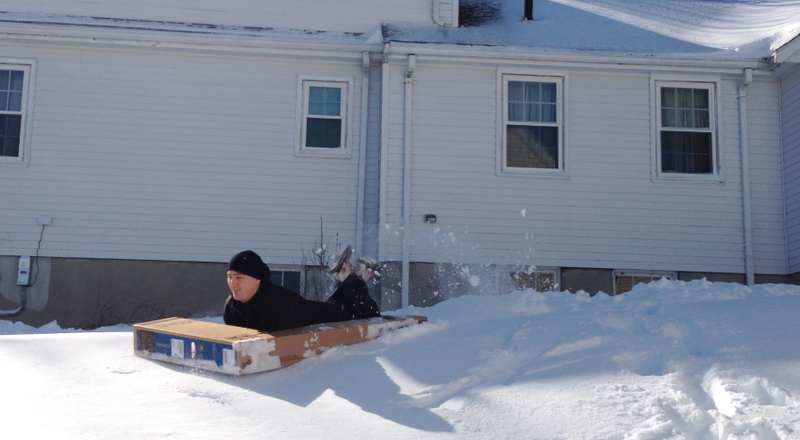 What do you do when you are snowed in and have a little hill in your backyard? You go sledding of course! We did not have a sled, so we had to improvise. Our sled for the day was our television's cardboard box. David went first and blazed the path and I was soon to follow. We ran and jumped down the hill dozens of time. It was a hilarious work-out. At one point, our neighbor opened the window, and leaned out laughing hysterically at the two of us "sledding" in the yard. My legs hurt from climbing up the hill in the 30 inches of snow and my sides hurt from laughing by the time we finally made it indoors, shed our layers, and warmed up over hot cocoa.